We have parking on the back off the restaurant. What better way to pay patronage to one’s country than with food? Like many others before them, owners Vagmar Stoffel and Rubiano Aguiar, originally from Brazil, longed for the warmth and togetherness that food brings the Brazilian people. Growing up, their family always gathered around the table to share ideas and talk about their day. It’s from that idea that Rio’s Steakhouse was born, more than just a restaurant – a family away from home. 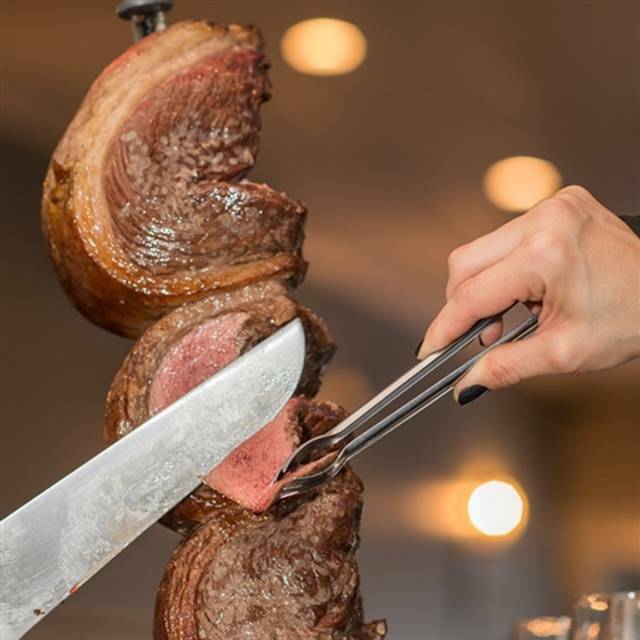 Vegetarians beware: Meat Lovers inside, Come experience what Rodizio is all about! Excellent service , great food ! Had to change reservation time and they were very accommodating! Looking forward to going back ! This was my 2nd visit to Rio. We were celebrating a few birthdays for the men in our family and knew this would be a great spot to go to. As always the food is delicious and the value is solid if you’re a meat eater like the men in our party are. The restaurant is small so you do feel rushed by other patrons as they wait for a table and it’s a bit loud but it’s a great night out! One of the best Brazilian steakhouses I’ve ever enjoyed. We go all the time, we love the staff, and we love the food......mmmm mmmm meat!! Awesome food, awesome service, awesome experience!!! DELICIOUS meat and side dishes. Very accommodating servers - our son has a nut allergy and they made a point to assure us that there aren't any nuts in any of the food. Fun and delicious - it was a fun family night out. Great place. Enjoyed the atmposphere and food. Thought the menu show more cuts of meet then I thought I had, but overall great place, would definitely recommend. After I paid my tip, they asked if I'd like to have them come over and sing Happy Birthday. I agreed, and they surprised my son with a little brownie cake and ice cream and "Happy B'Day" drizzled on the plate. Real class act. together to make your experience enjoyable. The food is very tasty and when they say "all you can eat" they mean it. They continuously come around with skewers of meat that is freshly sliced in front of you. The salad bar is way more than a salad bar with a large variety of unique, tasty, foods. I gave it three stars on the cost because I personally don't think I ate $28 worth of food; but I am sure many people do. We have been several times and always a pleasure everyone is wonderful and the food is amazing well worth the price. Lovely restaurant with a very attentive staff. Be sure to bring your appetite because the meats are amazing and you’ll want to try each and every one. We thoroughly enjoyed our dining experience - it was our 3 children’s first visit to a Brazilian Steakhouse and it was perfect. The staff, especially our waiter were friendly and attentive, the food was so delicious and abundant. We totally would come again. Thank you! It was just OK. I don’t feel like it was that great of a value and I even used a Groupon. We did not stay. We arrived on time for our 7:00 reservation, the hostess was no where to be found. People everywhere waiting to get seated. There is no clear designated hostess station, I finally found a girl who looked like she was in charge, she had no clue. The entire scene was chaos, the bartender was overwhelmed, it took a 1/2 hour for her to make eye contact and we finally got served. We finished our drinks and went to another establishment down the street. This is my favorite restaurant, and every experience has been memorable. The food and service is fantastic, as well as the restaurant itself being beautiful and comfortable enough for a private night out. This last visit was very surprisingly incredibly busy and loud, so busy in fact that even with my reservation (booked nearly a month in advance) we still had to wait over 20 minutes for a free table.. Ouch. I'm guessing this has something to do with it being the weekend following valentines day. Though it was incredibly hectic and messy, an unusual visit, everything was still delicious and the non stop meat train was more than worth the hassle. I'll continue to be a repeat customer and continue to drag my friends and family here. Just mind those holidays! Food and service are great. One of the best brazilian restaurants outside of Brazil I’ve ever been. The service was outstanding, but the restaurant is not large and was kind of crowded. The food was very good and it was a unique dining experience. It was very crowded and you should definitely make a reservation on Friday or Saturday nights. Our seats were very good (near the front window) but there were people seated near the buffet which is unfortunate. The servers that came around with the various meat on skewers were very friendly and encouraging to try all of the options offered. The buffet of side dishes and salads was plentiful. We would definitely come back. It was yummy in my tummy love it great food great service. Fantastic! Delicious food and welcoming service. Can’t wait to go back! The food was amazing and the place looked really nice. Small building but they make it work. Our waitress was very friendly but that was about it. Forgot to refill drinks and checked on all tables around us 2 times. From the entrance of this restaurant to the exit was 5 STARS. This was our first Brazilian style eatery, and we were not disappointed. Our waitress was attentive, kind, and full of knowledge. The chef cooked all meats to perfection! It is impossible to leave here hungry. We highly recommend the experience. Food was incredible and the service was great. An excellent Brazilian steakhouse without the $70/plate price tag! We went to this brazillian steakhouse for the first time. It is by far the best and nicest one I have ever been to. The staff was amazing and the food was incredible. worth every penny! The salad bar was fresh and the meat was delicious. Customer service was outstanding. I would recommend and have recommended Rio to my friends. See you soon. A friend introduced me to Rio and I was AMAZED at the quality of food (not to mention the quantity). I came home and told my wife we were going there that weekend. I took seven of us and we were accommodated easily with the same service as when it was two of us. All adults and three kids were very happy and left very full of very high quality food. Probably the best restaurant I’ve EVER been to from beginning to end. They may have spoiled me for any other restaurant in the future because I’ll be judging them against Rio! You owe yourself to go and experience this place. I would definitely recommend Rio Brazilian Steakhouse in Plymouth to my friends and family. The food is nice and fresh, service excellent, and always consistent. Best Brazilian food around ! 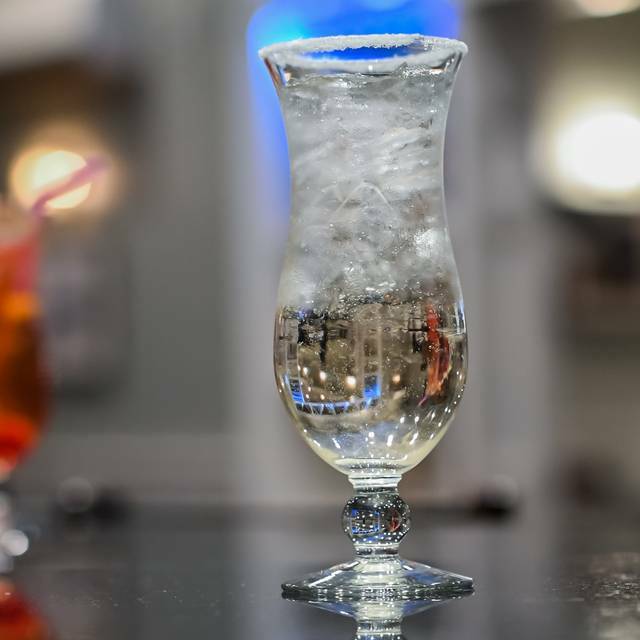 Great services, excellent drinks, highly recommend! Great food with a great atmosphere. We booked through Open Table and selected we were going for a date night. The staff was waiting for us with a table reserved by the fireplace. Staff couldn't have been more friendly or helpful. Service was always there. The food was very tasty with a good variety. I would definitely suggest this place to others! I invited several friends to come to Rio Brazilian Steakhouse in Plymouth for the first time. They all loved it and all of them said they want to come back again. The service was amazing. One of our guests doesn't eat pork and the beans on the buffet had pork in them. She asked if they have any beans with no pork. Within 10 minutes they had put out a dish of bean on the buffet with no pork. Amazing! Food was delicious! Everyone in our party was raving about the food. Great Food. A bit crowded. Wait time was excessive and reservations were useless. Great service otherwise. I brought my wife and three boys to this restaurant two years ago and now they are all hooked the food is great and the staff is awesome they make sure you do not leave hungry if you like steak and chicken and a nice salad bar this is the place to go. Every time my son’s make honors in school this is the restaurant they want to go. You will not regret your choice and bring pants that have some room in them. 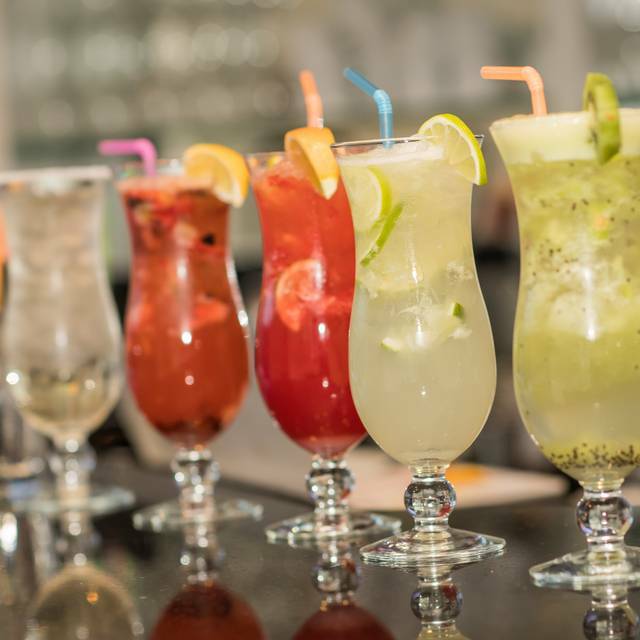 We've been to rodizios in Sao Paulo, San Antonio, NYC, and Boston, and the Rio can hold its own with any of them. The salad bar has ~20-25 items, hot and cold, and everything is fresh (the pao de queijo just about floats on air). The meat includes steak (garlic, flank, sirloin, sirloin tip), lamb, pork loin and sausage, and bacon-wrapped chicken. It is delicious, and the servers circulate continuously. The desserts are quite large; the flan and the molten chocolate cake are delicious. 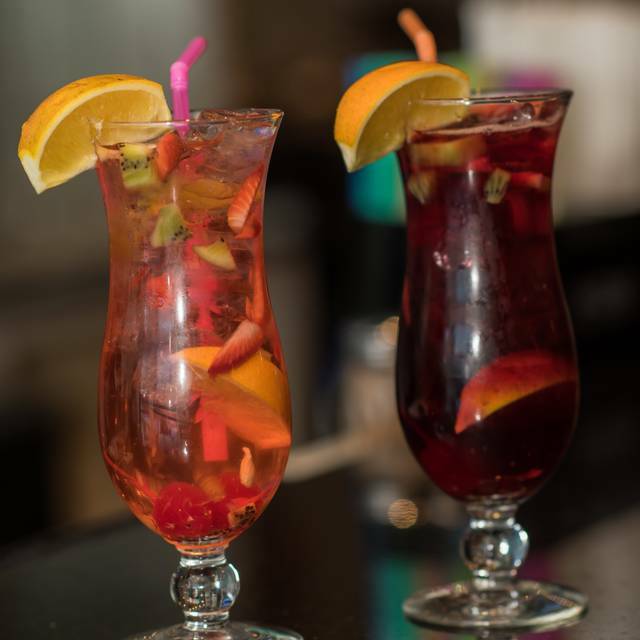 The sangria was a perfect complement to the meal. We've been to dinner twice, and brought a total of three other couples, none of whom had ever been to a rodizio before, and they all loved it. The Rio is also a great value. The Fogo do Chao chain charges double the price, and while its salad bar selection is larger, the quality of the food is no better. The noise level is not bad; even on a busy Saturday evening, it was possible to have a conversation with friends. We recommend the place highly, and plan to go there for lunch soon. Our servers were also very friendly and helpful. Always good overall. Good on value, service and food. Very enjoyable meeting. Very attentive waitstaff. We love dining at Rio. The staff is pleasant and attentive, the price isn't excessive for such wonderful food. The Brazilian grilled meats brought table-side and carved for each person is a delight. You can sample any or all of the grilled items as well as choose the amount of each you wish to have plated. The Malbec wine is perfect to pair with this type of meal, yet there is a wider variety of beers and wines to select from. In addition to the grill offerings,the buffet showcases a great range of salads and sides and meats. 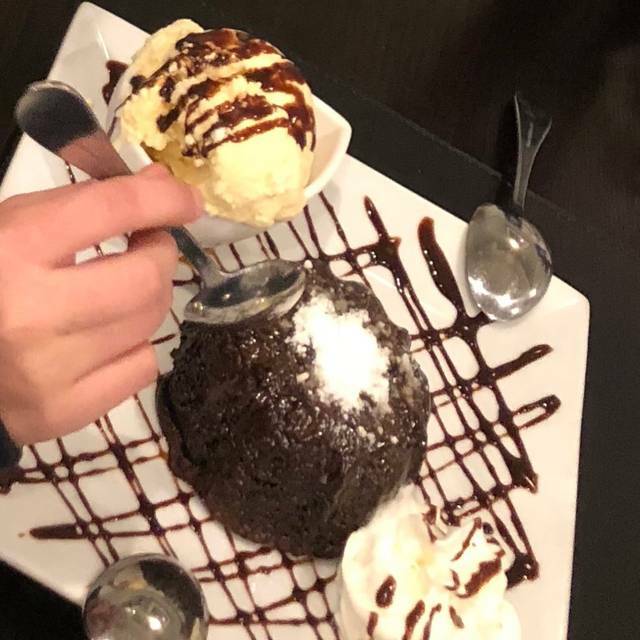 The hard part is all this is trying to save room for one of their wonderful desserts. Make this restaurant one of your favorites. We came here on New Year’s Eve for the first time and we were pleasantly surprised by our experience. All of the meat selections were excellent and they came around several times with the same selections in case you wanted another piece. The salad bar area looked clean and well maintained with a great variety of side dish options. All of which were very delicious. All of the waitstaff were extremely courteous, making sure that everyone was enjoying their experience and that everyone was getting the meat selections they wanted. This restaurant is a great value for all that you get. The only negative we had was that in the front room by the bar the tables are very close together which makes for a tight squeeze and lots of loud conversations next to you, but it’s a small inconvenience for such a great food experience.